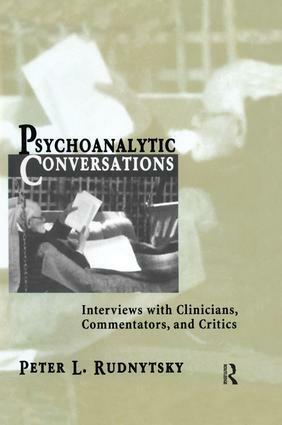 In this stunning addition to what has of late become a distinct genre of psychoanalytic literature, Peter Rudnytsky presents 10 substantive and provocative interviews with leading analysts, with theorists from allied fields, and with influential Freud critics. In conversations that Rudnytsky succeeds in making psychoanalytic both in form and in content, he guides his interlocutors to unforeseen reflections on the events and forces that shaped their lives, and on the personal and intellectual grounds of their beliefs and practices. Rudnytsky, a ranking academic scholar of psychoanalysis and the humanities, approaches his subjects with not only a highly attuned third ear but also a remarkable grasp of theoretical, historical, and clinical issues. When his interviewees turn from autobiographical narratives to matters of theory and clinical practice, Rudnytsky is clear about his own intellectual allegiance to the Independent tradition of object relations theory and his admiration for John Bowlby and attachment theory. His willingness to set forth his own point of view and occasionally to press a line of questioning infuses his exchanges with an energy, even passion, heretofore unknown in the analytic interview literature. Rudnytsky consistently emerges as a partner, even an analytic partner, in dialogues that meld discovery with self-discovery. To be sure, Psychoanalytic Conversations will find many clinical and scholarly readers among those who relish a good engrossing read. But it will have special appeal to students of analysis who share Rudnytsky's belief that if psychoanalysis is to remain vital in the new century, "it can only be by expanding its horizons and learning from those who have taken it to task." "A scintillating set of conversation pieces, affording a truly kaleidoscopic overview of the psychoanalytic world - distinguished psychoanalytic innovators, sympathetic observers and scholars from neighboring disciplines, and provocatively challenging critics. This volume provides impressively illuminating insights into lived psychoanalytic history, as well as brilliant discursive elucidation of major contemporary issues in psychoanalytic scholarship and theory. The author's own perspective is a full match for the insights and erudition of each of his ten very singular interviewees." "Peter Rudnytsky has put together a series of interviews of extraordinary interest not only to analysts but also to anyone concerned with psychoanalysis. The content is very wide-ranging, from personal histories and anecdotes about prominent figures in the history of psychoanalysis, to sophisticated discussions of psychoanalytic theory, to current controversies in the field. Rudnytsky is an intelligent, informed, straightforward, and provocative interviewer. Expertly, he draws out the humanity and the creativity of his interviewees." Peter L. Rudnytsky, Ph.D., is Professor of English at the University of Florida and Editor of American Imago. He is the author of Freud and Oedipus (1987) and The Psychoanalytic Vocation: Rank, Winnicott, and the Legacy of Freud (TAP, 1991) and is a corresponding member of the Institute of Contemporary Psychoanalysis in Los Angeles.